The sounds of individual bird and insect species, and Earth sounds like wind, water, rain and thunder, comprise ephemeral wholes that may be called "soundscapes". As expressed by Dr. Bernie Krause in his book "Wild Soundscapes", "much more can be learned by listening to the collective sound expressed by an entire biome, or habitat of these creatures. The density and texture of natural soundscapes always convey more robust information and offer more details than any single element can reveal on its own". In accord with this approach, most of my field recording effort is applied to capturing the ever-changing soundscapes or biophonies of Hawai'i. 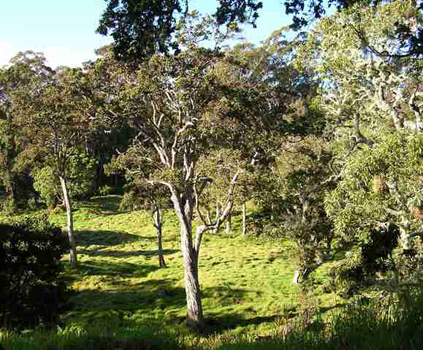 Hear the forest awaken at 6000' elevation on Mauna Kea. See Mauna Kea Soundscapes.